So as you might have guessed, I’ve now been in London for ten years which is an amazingly long time given I never planned to live here in the first place. London is many things, and one thing I’ve noticed it be a few times is frustrating. It’s busy, noisy, expensive, smelly… And when you’ve been stuck in a non-moving tube train for nearly an hour in the middle of summer, you can easily get in a negative mood. However it’s also good to think positive at times. So a few months ago, whilst Catherine and myself were deciding what to do with the whole “job moving to Salford” thing, I was sat outside the National Theatre supping a beer, and came up a list. A list of things I really like about London. Of course in the end we decided to stay. And I suspect the things on this list had something to do with that decision. Anyway, in no particular order, here goes the list. I couldn’t really start this list anywhere else than the location where I first started thinking about it. 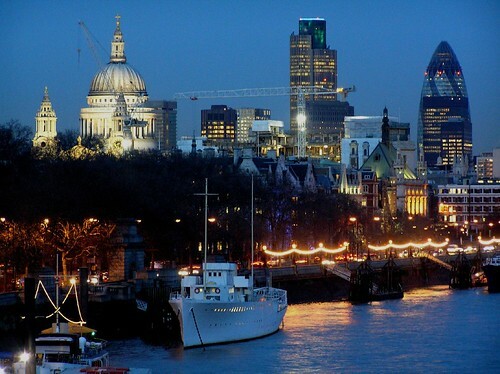 London’s South Bank. I just love it. If you know nothing about London then I guess I’d better explain. As I’m sure everyone knows, the River Thames flows through the city on its way to the see. Most of what people think is London sits on the north side of the river – the City of London, Oxford Street, the Gerkin, Piccadilly Circus, Covent Garden and, of course, the excellent Playing Games shop in Bloomsbury. 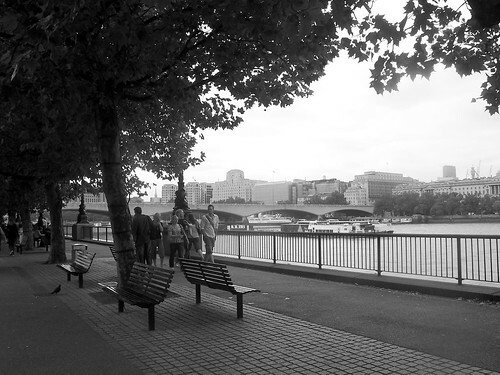 But on the north bank of the river is… well frankly… not very much. Buildings. Roads. Over on the other side of the river however is something different. It’s a couple of miles of modern culture. The National Theatre, the Royal Festival Hall, the London Eye, Borough Market, the Millennium Bridge, Southwark Cathedral. And all this and no roads either. You can walk along the south bank of the river and have the Thames on one side, and important and brilliant looking buildings on the other. I love walking down from Tower Bridge towards Waterloo. It makes me feel really, deeply happy in a way few other parts of London do. There’s the police officers having their photos taken with tourists. There’s Tower Bridge dominating majestically. There’s Tate Modern just standing there. The skateboarders zooming on the ramps. And then there’s the bars and restaurants. There’s few places in central London where you could sit outside, enjoy a riverside view and bask in the sun. The South Bank Centre is perfect for this – well almost perfect. They don’t serve real ale… But anyway it’s just a great place to be. Always something going on, and always worth a visit. It’s somewhere I don’t get to go anywhere near often enough. But when I do, I love it. How do you follow sights, sounds, smells and culture? By talking about buses and trains of course. It’s so obvious. And we have to talk about it because London is one of the few places in Britain you can live most of your life without needing a car because the public transport is so good. Now lots of people will moan and complain about the state of London’s transport. But they deserve to be fwapped on the head and forced to live in rural Cornwall to see what it’s like living in the real world. Okay London’s transport isn’t perfect. 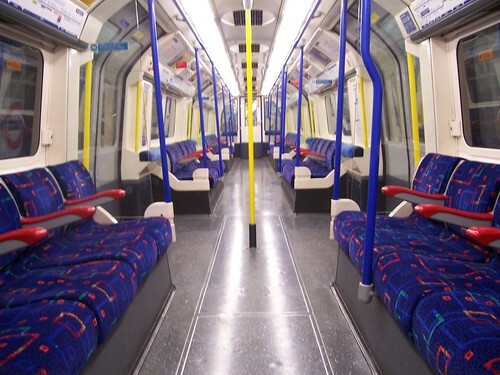 It’s regularly overcrowded and the tube has been starved of investment until recently. But on the plus side, it’s frequent and usually pretty efficient. How many other places in the UK can you just turn up to a station at and know that you’ll get a train in a few minutes going where you want to go, seven days a week? Early mornings and late evenings? And where there’s a comprehensive, daily network of night buses to take over when the tube stops? People outside London sometimes balk when I tell them how much my annual travelcard costs. However £1200 for trains and tubes, zones 1-3, and buses and trams throughout Greater London sounds good to me. The average car probably goes down in value that much per year – and that’s before you’ve even take it off the drive. And who really wants to be sat in a traffic jam anyway? Photo by Diamond Geezer. Creative Commons licensed. A friend of mine enjoys telling the tale of someone visiting him at his office in the City of London. Said visitor left the tube station and phoned him up so that they could meet. “What can you see?” asked my friend. In one of his books Bill Bryson said that UK towns are just the same thing reshuffled slightly. There’s always going to be a Tesco, a Natwest, an M&S… In London its even more so – the chains are everywhere. All prevailing. All dominanting. Sometimes you walk down streets and think you could just be anywhere in the UK. Where it not for the buses. See you can go any five towns in the UK and chances are the buses will the same or similar in them. They’ll either be Stagecoach’s white and blue, or they’ll be First’s revolting purple, pink and off-white. If you’re lucky you might get see Arriva’s rather odd turquoise and cream. Other bus companies are, of course, available, but there can be few places where you won’t see either Stagecoach or First’s buses. As Bill says, it’s the same deck of cards, reshuffled. Except in London. London’s buses are red. Red. Red. RED! Yes, they’re almost all run by big bus groups. You’ll find First’s buses in London. But they’re red. You’ll find Arriva’s buses in London. But they’re red. Stagecoach don’t run buses in London, but if they did, they’d be red. 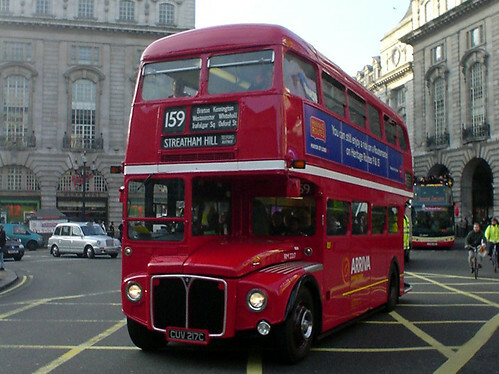 The red London bus is an icon and it’s a very visible one to everyone in the city. It’s part of the identity, and whilst London buses may have been privatised, that identity wasn’t allowed to be dumped at the same time. The British Museum is a great place. 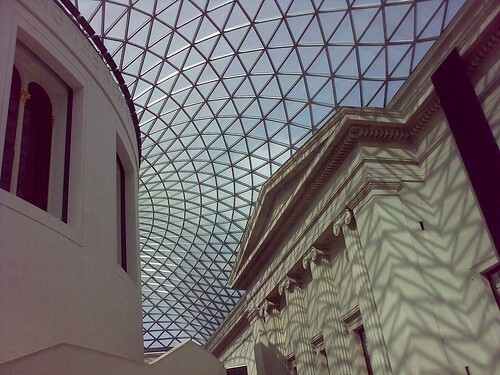 But there Great Court – the central quadrangle with that fantastic roof – is, for me, one of the highlights of London. Photo by *Tom*. Creative Commons licensed. In the evening when the museum itself is closed but the courtyard still open, it’s just a fantastic place to stand and marvel at something truly wonderful. Relaxing and inspiring all at the same time. In 2003 we moved to Colliers Wood in south west London. At the time I was working at Bush House in the centre of the Aldwych. I quickly found the easiest way to work was to get the Northern Line to Waterloo, walk over the bridge and enter the building’s back doors. Photo by rsambrook. Creative Commons licensed. It was a walk I always enjoyed doing. There’s always a great feeling you get when you’re crossing the Thames, and Waterloo Bridge is one of the great places to do it because you get some great views. On the west is Parliament and the London Eye. On the east is the South Bank, Somerset House and St Paul’s Catherdral. It always made me feel pretty good, even when I was huddling under an umbrella as the rain thundered down. But for true delight, this is a crossing that has to be done when the sun has set and the sky is dark. For this is when it becomes truly magical. All the landmarks are lit up. Illuminated boats are chugging down the river. It’s a view that makes me breathless; that I have to stand there, take a deep lungfull of air and want to shout “THANK GOD I AM ALIVE!” I just love it. Love it to bits!